VASCO inverters are a range of highly versatile variable frequency drives, designed to control and protect commercial pumping systems by varying the pump speed. Air-cooled it requires adequate ventilation. 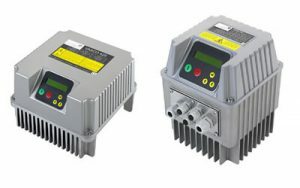 Can be connected to any manual pump on the market, and will manage the operation of the pump to maintain a constant desired parameter (such as pressure, flow, temperature or other). The pumping system runs only at the speed necessary to meet user’s requirements, ensuring energy savings, eliminating water-hammer and extending the life of the system. The body is constructed entirely of aluminium, with compact size, light weight and durability. IP55 ingress protection makes it possible to install in humid and dusty environments; the LCD backlit display ensures easy operation and a buzzer provides an immediate indication of alarm.